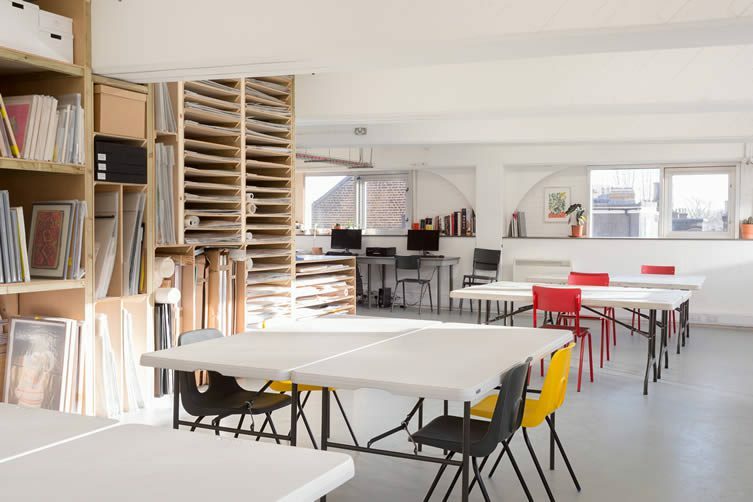 Intoart is a visual arts organisation and studio in South East London. 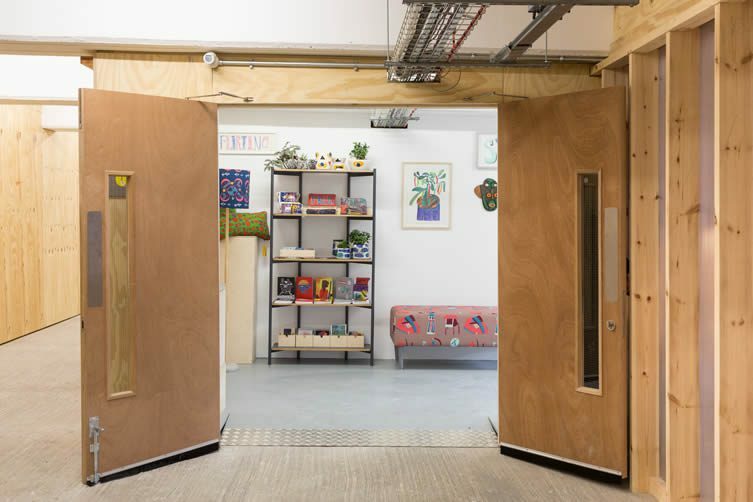 Uniquely, it inclusively works with people who have learning disabilities; founded by Central St Martins graduates Ella Ritchie and Sam Jones in 2001 as a response to a lack of high-quality arts education and limited opportunities for artists with learning disabilities. 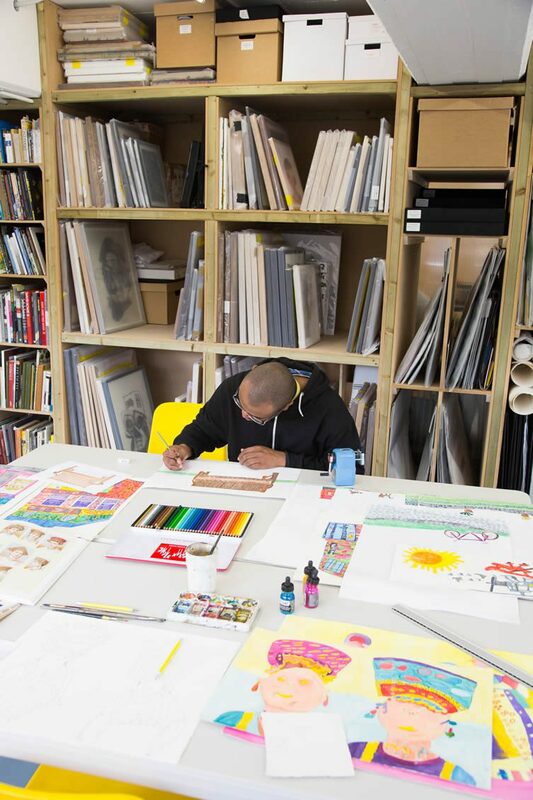 Currently, there are 21 artists—working across fine arts, illustration, ceramics, textiles, and fashion design—that regularly work in the studios on a range of portfolio, commission, and collaborative projects. Intoart is a multifaceted body that is not singular in its approach. With a focus on creativity as standard, it is also about mentorship and confidence building. Members also partner with schools and art colleges to share their skills and experience with young school leavers. 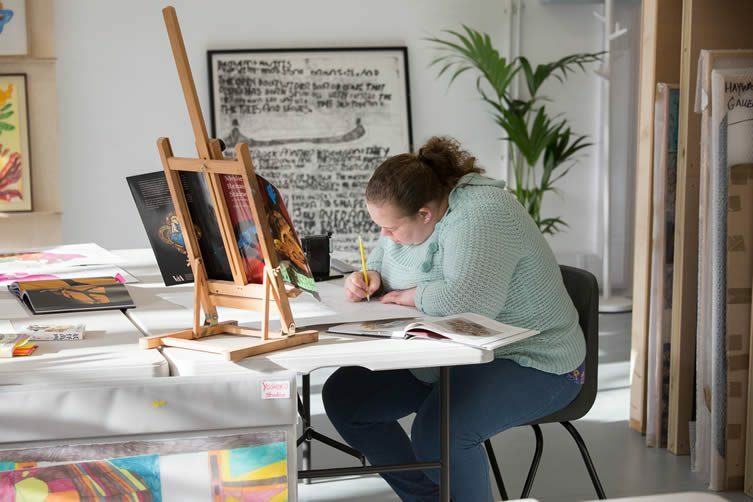 The mentor/mentee relationship not only opens opportunities for young people with learning difficulties, but also develops a broader conversation about the art world and what can be achieved. 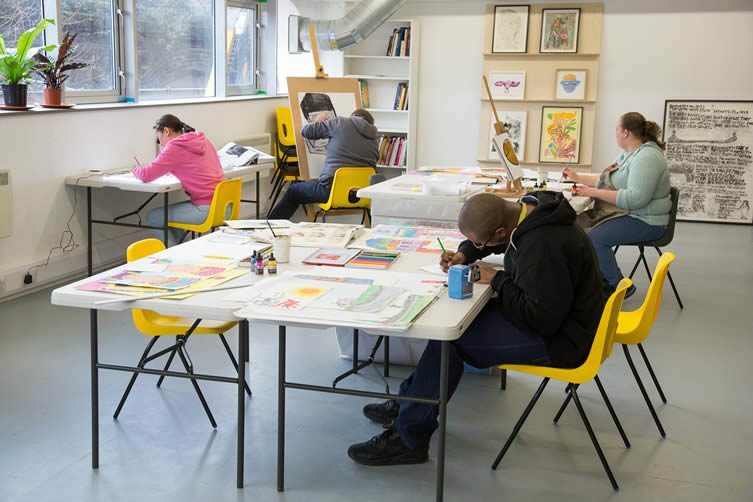 With respect and credibility, Intoart’s primary mission is to provide a platform for people with learning disabilities to become visible and equal in the art world. Having already presented an extensive public programme of exhibitions and events, they also aim to impact on policy and practice in learning disability and education relating to contemporary art. Exhibiting widely at some of the country’s most celebrated institutions—including Whitechapel Gallery, Victoria and Albert Museum, Poetry Library Southbank Centre, and the Tate—collaborations with artists and designers are also very much on the agenda at Intoart, and are mutually beneficial for all involved. Clifton Wright ceramics, in collaboration with Nikki Tibbles Wild at Heart and ceramicists Pip Hartle and Miray Mehmet at Standpoint studios. 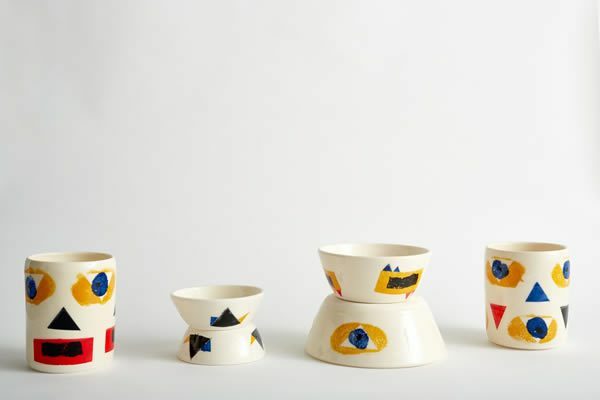 One collaboration in particular saw Introart talents partner with Nikki Tibbles, founder of Wild at Heart, and ceramicists Pip Hartle and Miray Mehmet to create wonderfully contemporary and vivid ceramic pots using surface design, pattern, and colour techniques. We’re advised that many more similarly inspired collaborations are in development, as the future of Intoart only looks more and more compelling. Speaking to co-founder Ella Ritchie, We Heart discovers that Intoart could possibly hold the UK’s most extensive collection of work by artists and designers with learning disabilities, more detail about how their project works with the community, and discover the myriad of challenges that face them as they continue to thrive. Tell us why you set up Intoart? 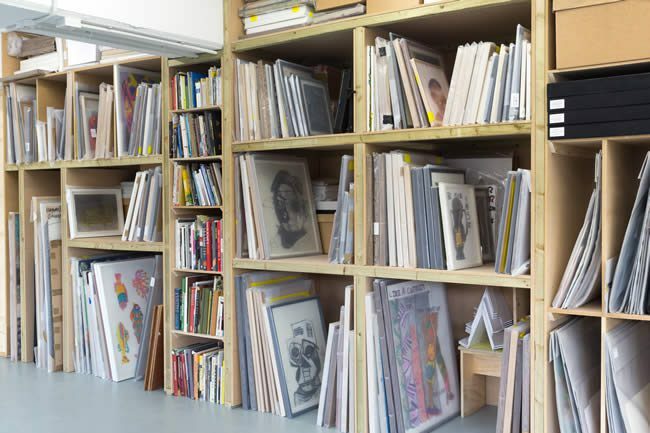 Sam Jones and I set up the organisation in 2001, the year after we left art college, where we studied fine art printmaking at Central Saint Martins. From the very beginning, we were committed to bringing about change in response to the need for, and lack of, high-quality arts education and opportunities for and by people with learning disabilities. 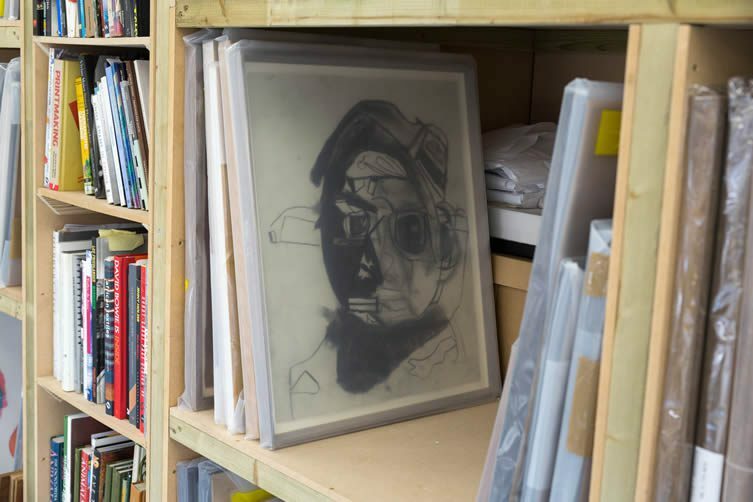 We developed our first eight week project in Peckham, and we now run a full-time programme comprising an art studio, design studio, exhibition programme, solo artist programmes, mentoring projects, and an archive of more than 2,000 artworks. Visibility and equal opportunities within the arts are key, how will Intoart accomplish this? Our vision is for people with learning disabilities to be visible, to be equal and established artists. Assumptions prevail that people with learning disabilities are the recipients of a service and are participants rather than contemporary cultural producers in their own right. We plan our artistic programme to create opportunities for production, leadership, and audience engagement; which is important in developing the networks and platforms for visibility. 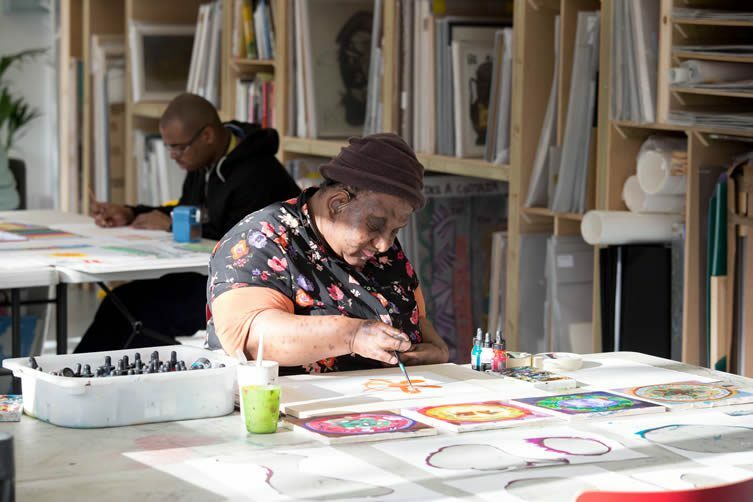 How far do you think people with learning disabilities have to go to experience equal education and opportunities in the art world? There’s a considerable amount of work still to be done to raise expectations and challenge preconceptions—with increased ambition, the artwork made by artists from Intoart can be a strong counter to those prejudices. More people need to see and experience the work. For that to happen we look to external collaborations, partnerships, and individuals that can spark new and exciting opportunities for the future. 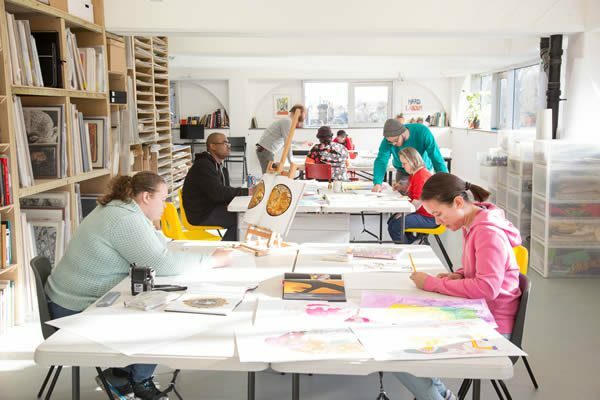 We are, in some senses, an art school experience for people with learning disabilities—as we offer the opportunities to learn about materials, work, and contribute to a creative community of peers; developing and communicating ideas through visual art forms. What can we look forward to in 2018? It’s exciting times as we have moved into the centre of a new creative space at Peckham Levels [where seven empty levels of a multi-storey carpark have been transformed into a new creative workspace and cultural destination], it presents lots of potential opportunities to diversify our work across different mediums and scales. At present, we are focussed on the production side of our studio activity and have some exciting collaborations that we look forward to launching later in the year. A number of the artists also have opportunities within group exhibitions in contemporary art spaces later in the year. How do the day-to-day activities run? Do designers and artists work on their pieces full-time? Are they local to the studio, and can anyone apply for the programme? The studio runs throughout the week. 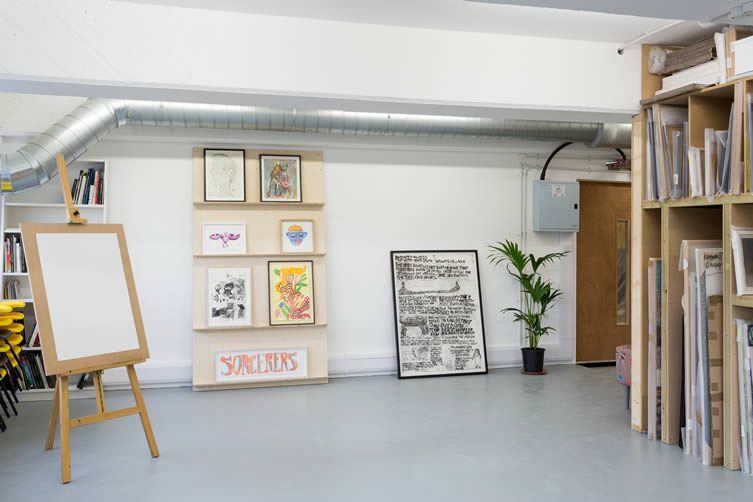 Artists come into the studio on different days of the week ranging from one to three days per week depending on projects, commissions, or exhibitions that they are working towards. We currently work with 21 artists, some are new to Intoart (having joined this year in the new space), and some have been members of the collective for over ten years. 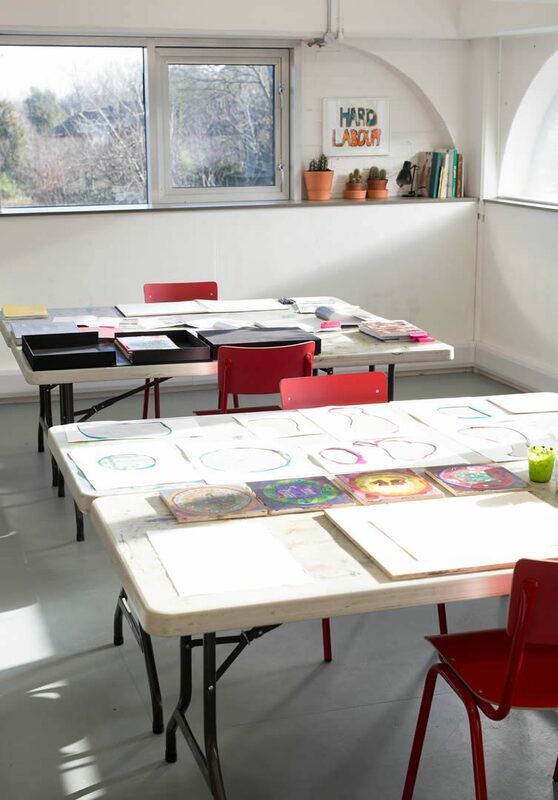 To reach people who might be interested in joining Intoart—and to try working in the studio for the first time—we have networks with voluntary sector organisations and local authorities, schools, and colleges. 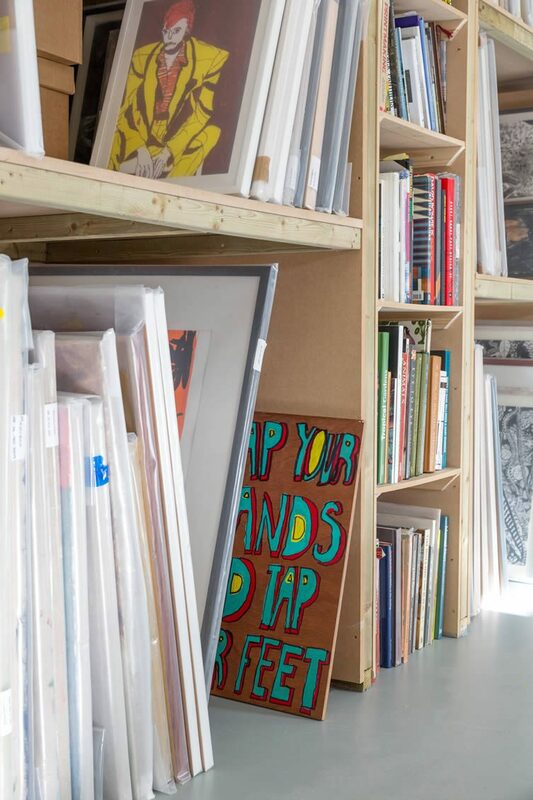 Your archive of over 2,000 artworks is growing, could it be one of the most extensive collections of work by people with learning disabilities? If so, how significant is that to Intoart, the individuals involved, and in the art world as a whole? 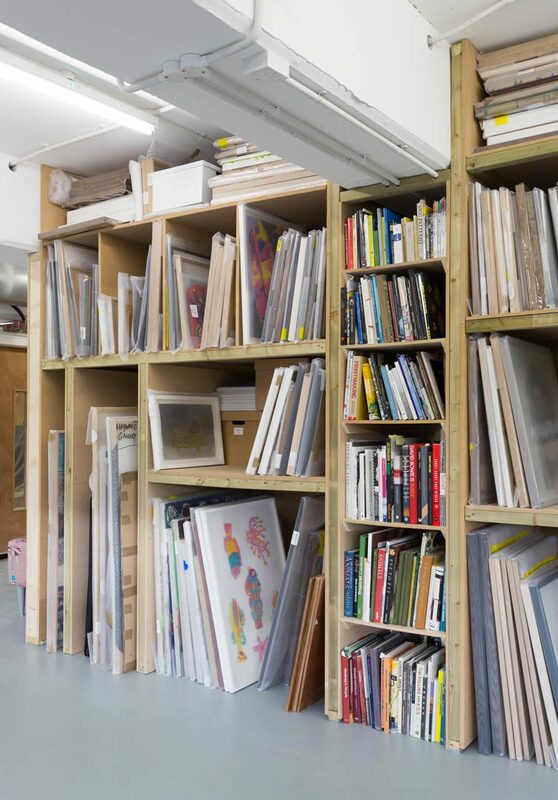 Established in 2013, the Intoart Archive includes over 2,000 artworks and research relating to Intoart’s studio, exhibitions, and events. Indeed it’s a big collection of artwork, we are not sure if there are larger collections in the UK. We wanted the archive to be active and as a tool to activate further learning, thinking, and making. 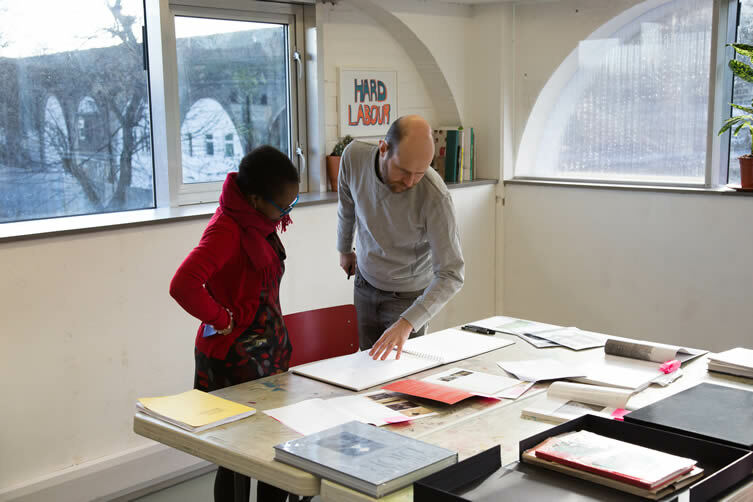 In the new space we are looking forward to the potential for the Intoart Archive to be used increasingly by curators to undertake studio visits with artists and to develop exhibitions. To learn more about the Intoart archive you can view our Live Archive film. 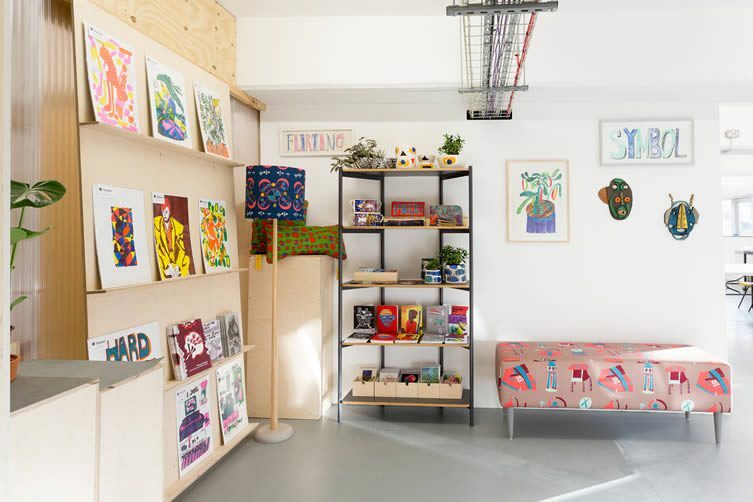 You have worked with ceramicist Pip Hartle and fashion designer Holly Fulton, to name just two collaborators, can artists and designers with full abilities get involved in a teaching or mentor basis? Yes, it’s really important to us that we are collaborating with other designers and artists as part of our inclusive ethos and studio practice. 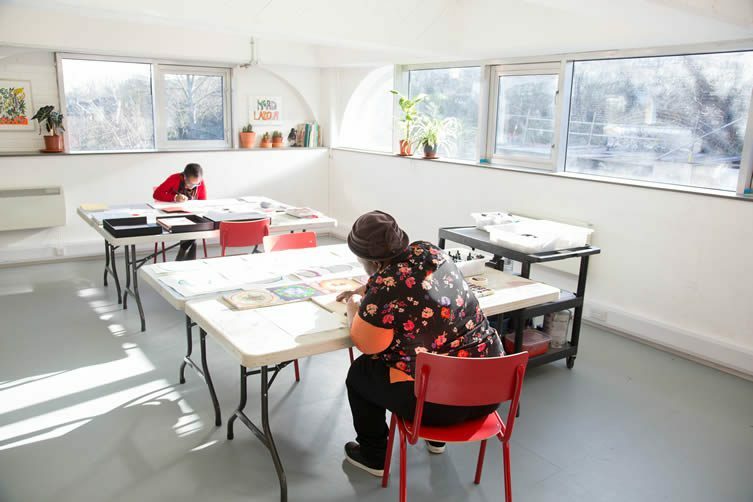 Inviting people to work with us recognises the new skills and ideas we can bring into the studio to equip people with learning disabilities with learning new skills, developing their ideas through different materials, and progressing in their practice. It’s also important that we recognise the learning and creative impact that visiting artists and designers gain from working with Intoart and the artists as a mutually beneficial process. Where do you hope to see Intoart in ten years time? 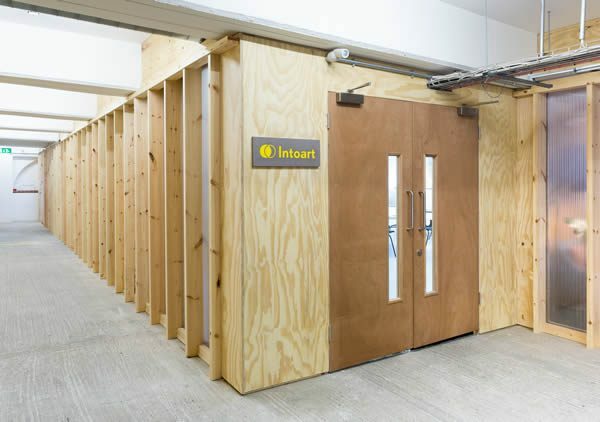 Moving to our new space has given us a lot to think about in terms of new possibilities for Intoart. We would really like to see increased investment in the arts for this area of practice in particular, to enable the realisation of more ambitious bodies of artwork by artists that get seen by larger public audiences. We hope that the design studio goes from strength to strength, and for more opportunities to collaborate on products that have a wider distribution and scope regarding the application of our ideas to a more expansive range of interior and fashion collections. We are actually working on a new and exciting fashion collection, currently in development and due to be released in the autumn, which is definitely one to keep an eye out for; one that we are really excited about.